Inspired by Pedro’s daily updates for the road to Nix, I thought I’d start a daily research log for data sync. It is becoming increasingly obvious that we need to make this a priority and work on getting it into the app as soon as possible. This will only become more apparent in a few weeks time when we have Chaos Unicorn Day. In order to get this done right we need to do our homework. This means looking at multiple existing solutions and comparing them, so we can make an informed decision on what trade-offs we are making and why. Right now, we have a rough PoC spec based on BSP, simulation and Whisper-based end to end PoC (video). One mistake I made is settling too quickly on Bramble Synchronization without understanding the underlying principles or design decision behind it in more detail. It might be the case we’ll end up with something similar at the end of this, but the rationale should be stronger. If Status is to succeed in its mission to have widespread adoption of Ethereum, having reliable, decentralized messaging is a requirement. Currently, we are relying on a centralized setup to provide reliable messaging. The challenges in providing reliable messaging for decentralized systems are plentiful: you don’t have a single source of truth, and because nodes are autonomous they can join and leave the network at any time, which impacts availability of individual nodes. A common approach for dealing with these problems in a distributed setting is to do data replication, i.e. store the same data in multiple places. A natural way to do this is in a pure p2p setting is to let the participants in a group chat store each other’s data (messages). Additionally, since we are building for mobile, it is desirable to have other nodes take part in this replication process. This relates to the work being done on network incentivization. How does this relate to the other protocol work? Data sync is part of it, and the most immediate need from our point of view. Collaboration and research for transport privacy and conversational security layer will continue, but this takes priority now. Additionally, having a clear understanding of how the data sync layer will look like is important for the other layers as well, as it informs design decisions and constraints. Posting first entry in a separate post. Citation: Martins, Vidal, Esther Pacitti, and Patrick Valduriez. Survey of data replication in P2P systems . Diss. INRIA, 2005. Summary: This paper goes through various dimensions of data replication in a p2p context. It breaks the problem apart into different dimensions. It is focused on large scale collaborative documents. As a literature review, it starts by breaking down basic concepts such as multi-master, asynchronous, optimistic replication, etc. Examples of read-only p2p data replication is Bittorrent, where we are replicating a file consisting of chunks, but this file doesn’t update. For write-support the main choice is whether we want to single-master or multi-master. Question: Since the minimal unit of replication for messaging is a message object, these are immutable and never change. A device would then write a message to their own log, sync with other nodes, and this message would never change, it’d be immutable. Does this mean a single-master is more relevant to us, or am I looking at this problem wrong? Also see Dangers of Replication a Solution below. The paper then goes further into P2P network overlays etc, which seems worth looking into more. They also reference a bunch of common technology and how they fit in, such as DNS, CVS, etc. However, it seems like the end of the paper is about their own protocol, which I’ve never heard of before. A lot of the focus seems to be on the collaborative aspect, where you deal with updates to the same piece of (complex) object, which seems less relevant to us. Relevant keywords: data replication, reconciliation, eventual consistency, P2P Networks, optimistic replication. Replication: Theory and Practice (Lecture Notes in Computer Science / Theoretical Computer Science and General Issues) seems like a good overview, worth looking into. One-Copy Serializability with Snapshot Isolation under the Hood. I’m not sure I understand exactly what one-copy serializability means, but it seems key to (non-)optimistic asynchronous replication. Immutability Changes Everything - it seems to me a lot of literature assumes update in place, as opposed to dealing with immutability. Having a better understanding of what dimensions can be ignored due to this would be desirable. The Dangers of Replication and a Solution. Talks about replication strategies and problems with multi-master. Extends model with two-tier replication, that has a mobile node and base node. I started a comparison between Bramble and Matrix replication protocols, but I realized I didn’t have a good enough of understanding of the underlying components/dimensions. Thus the shift to going over survey literature. Super rough notes can be found here: https://notes.status.im/i0HGdbhpS3KOvisv0jPy8w?edit, once I understand the commonly agreed upon dimensions, I’ll re-do this table, and probably include a few other protocols. I used to have a spreadsheet of people, and I have spread out notes of this. Going to collect this and add to the document. To get started with, I added a few people with their relevant area and group affiliation. Didn’t look into them into more detail. Keep looking into data replication protocol dimensions, e.g. survey literature. Replication book, some more in immutable logs. Catching up with some previous notes and also looking into consistency models. The paper on high risk users and disconnect with developers is relevant for understanding who we actually building for. Halpin, Harry, Ksenia Ermoshina, and Francesca Musiani. “Co-ordinating Developers and High-Risk Users of Privacy-Enhanced Secure Messaging Protocols.” International Conference on Research in Security Standardisation. Springer, Cham, 2018..
Slightly different tract but I came across this paper again and thought I’d write up my thoughts around it, as it might be useful to other people at Status. Mostly read bits and pieces, didn’t deconstruct or read in detail. Summary: Survey of developers, low risk and high risk users and what they want in a secure messenger. 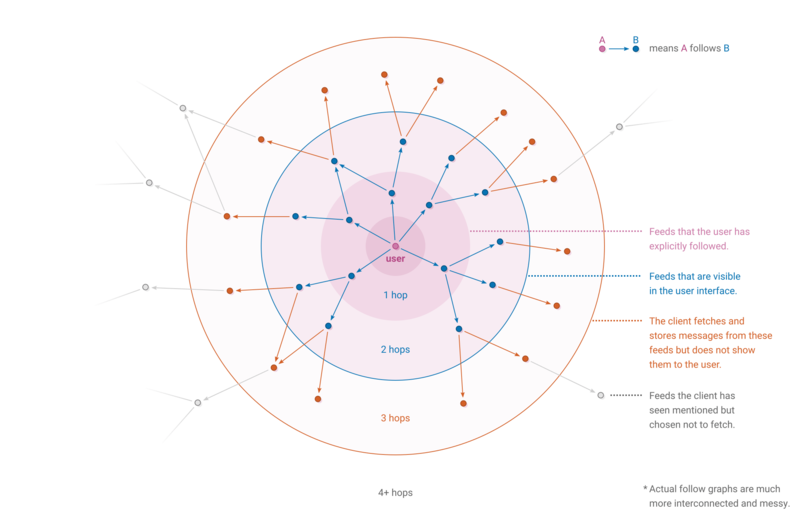 Explores two hypotheses (1) Developer-User disconnect (see needs and priorities differently) (2) High-Risk user problem (high risk users have different needs). Based in interviews and field work. Looks into dimensions such as: main threat; security (key verification, ephemeral messaging); privacy (metadata collection, pseudonymity); group support; decentralization; standardization; open licensing. Evaluation: Largest scale user story of real world high risk users, and developers of these messaging apps. Definitely worthwhile to skim and think more about as it relates to what we are making, even if their conclusions are not always correct (“they would’ve said they wanted a faster horse”) Example takeaways: High risk users don’t care about decentralization, standardization, and open licesing. They do very much care about metadata collection, pseudonymity, ephemeral messaging and group support. Their main threat is client. Example to illustrate this: their threat model might be the local government spying on them, where a perfectly fine solution is to use Google Drive for photos, and the motto “Use Tor, Use Signal” doesn’t make sense for a user in . They just want to be protected them the local government. There are more stories of this nature. The biggest difference for high-risk users as I see it is that they generally have a very specific threat model, and they will use whatever tool to solve this problem. The stakes for them are real, so they can’t afford the luxury to wait for something perfect, nor do they care much about “developer tribalism” as they are primarly acting in a different arena. Further reading: See below for decentralization and privacy survey. Troncoso, Carmela, et al. “Systematizing decentralization and privacy: Lessons from 15 years of research and deployments.” Proceedings on Privacy Enhancing Technologies 2017.4 (2017): 404-426..
Also by same author as above and relevant, so I might as well include it here. 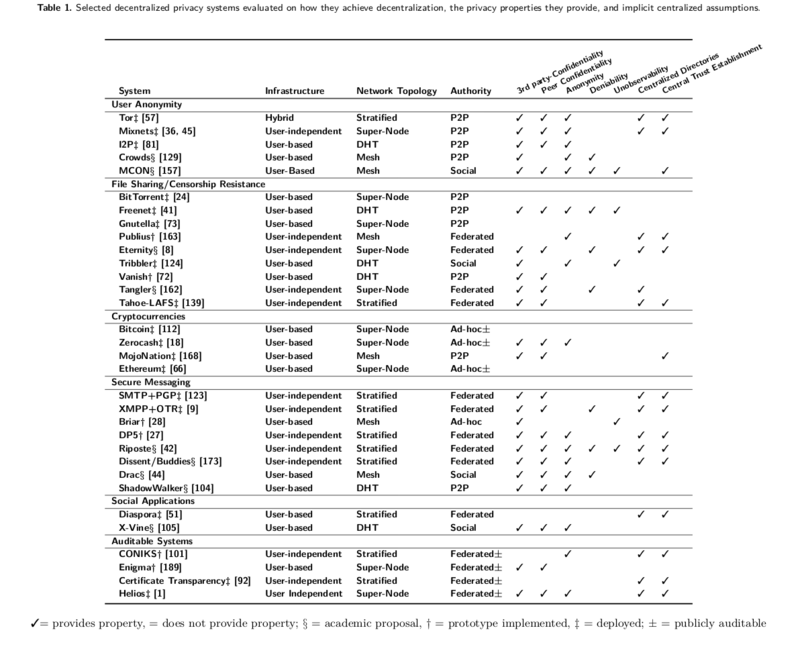 This looks at the problem space of decentralization wrt privacy, and compares various types of systems, Infrastructure, Topoloy, Authority, and other attributes. Only skimmed so far, see below for excerpt. Charron-Bost, Bernadette, Fernando Pedone, and André Schiper. “Replication.” LNCS 5959 (2010): 19-40. Large book. Based on 30y of research and summarizing what we know, which is a lot. Worried about it being a bit too academic and not applied enough, especially for things like p2p. Chapter 1, Consistency Models for Replicated Data by Alan D. Fekete and Krithi Ramamritham, available online. Summary: Consistency models overview and how to think about. A consistency model is the set of properties replication algorithm provides, and the guarantees this gives the user. This is important to compare different systems, and especially important for application developers, because it helps them understand the behavior they see when interacting with a replicated storage system. Provides overview of sequential data type, strong consistency, weak consistency and transactions. A sequential data type is a formalization of a set of operations and how they impact some state. Simplest model is a read-write single-bit system that supports read() => ok; write(0) => 0; write(1) => 1 operations. Through this we can then look at a sequence of such operations and make sure things make sense at each step. This leads to the notion of linearizability and serializability. Strong consistency: all accesses are seen by all nodes in the same order (sequentially). For replication, this means you are likely to have problems with e.g. latency and avaiability. In practice this usually require a single sequence node to guarantee that nodes receive messages in same order. There are a bunch of different consistency models. The ones that are most likely relevant to us are eventual consistency and casual consistency. Weak and strong consistency appears to be more of a continuum, e.g. see Wikipedia and Jepsen below. Eventual consistency: Update then propagate, puts a premium on availability and disconnected operations. It’s a liveness property not a safety property. In absence of updates things settle down to the same state. They also include a more formal definition. Session properties: to be more convenient, we have constraints for what type of operations we do. These are things like Read Your Writes and Monotonic Reads. Casual consistency: roughly a subset of eventual consistency, which gives us some casual ordering. There’s also more on transactions and things like snapshot isolation and one-copy serializability that I didn’t look into. Evaluation: Good to place some concepts in context and put name on things. A bit too academic though. It leads to some other good resources and further reading as hinted below. And it points to the importance of evaluation consistency models, as it provides a form of interface and UX to whoever is using the replication layer. Message queues relevant for propagation, and if so how to think about mutability? Blockchain as consensus engines / data availability layer, when relevant/leverage? For eventual consistency we need simulation to get reasonable bounds for latency. Are there any other consistency models people use apart from casual consistency in p2p replication? Session properties that are relevant and how it impacts how the layer is used? Paper mentioned group communication protocol, ch 3.2, 5, seen this a few times and seems like a relevant part of the literature. I also don’t feel like I fully grok linearizability and serializability. Linearizability is about the correctness of a single operation for a single object behaving as if you have a single-site unreplicated system, writes appear to be instantaneous. There is some difference depending on if researchers come from distributed systems background or database research. Jepsen Consistency Models - helpful clickable diagram of different consistency models and how they imply each other. Definitely worth looking into more, especially around Casual Consistency and Writes Follows Reads, etc. Jepsen studies safety properties distributed systems, specifically how these systems violate various consistency models. Herlihy, Maurice P., and Jeannette M. Wing. “Linearizability: A correctness condition for concurrent objects.” ACM Transactions on Programming Languages and Systems (TOPLAS) 12.3 (1990): 463-492. Updated the doc with a ~5 more possibly relevant people. Still no triage. Mix of known individuals and some name of people come across. General heuristic: should have relevance in more than one field, i.e. replication and p2p, not just database researchers (e.g.). Sort out single-master/multi-master relevance, not clear what best lit or mental model for this is. Related to immutability and questions on shared memory above. Data access is done through transactions, which is a series of read and writes followed by a commit. Minimal object we want to object are chunks of data, aka messages or events. Two ways of looking at Matrix: Server 2 Server API only or the federated reality with Client-Server API. Different properties. This is an awesome initiative @oskarth good stuff, wdyt about setting up Zotero and a group so we can create a library of papers/research articles, categorize and comment on them etc? Also curious if you intend to increase the scope of your comparative research with other projects like Scuttlebutt? That’s a good idea, I’ll look look into it. Collaborative research ftw. Scope: Yes, initially limited but that is the intention. E.g. grow both in dimensions (column) and what is being compared (rows). Abbreviated day due to meetings. This isn’t controversial, and I read it a few years ago when working on event sourced architectures with distributed message queues, but it’s useful to re-read. Summary: LinkedIn many problems reduced to writing a log. Aka write-ahead log, commit log, transaction log. This article outlines what it is, why it’s a fundamental data structure, where it is used and how you can extend it and scale it. It also links to various related distributed systems literature. What: Append-only, totally ordered sequence of records ordered by time. Discrete log time. Record what happened and when. Immediate authoritative source; then use projections on top of it. Machine-readable, often internal in DBs etc. PostgresqSQL etc log shipping protocol to transmit part of log to replica database which acts as a slave (NB indicates master-slave). Problems it solves: (a) Ordering changes (b) Distributing data. State Machine Replication Principle: If two identical deterministic proccesses begin in the same state and get he same inputs in the same order, they will product the same output and end in the same state. A replica can then simply be described by maximum log entry they processed. Two models: State machine replication model primary backup model. What’s the difference? In state machine replication model we write write transformations/events to the log and then to each peer. Vs primary-backup: go via primary node, then log results. Example: Arithmetic service starts at 0, then +1 *3. Logging transformations (+1 *3) or results (1, 3). A log can be seen as a series of decision of the next value to append. Relevant for distributed, consistent, shared log. E.g. see RAFT, Paxos, Viewstamped Replication (? ), [and blockchains]. Theory before practice in distributed system research, which might explain why there’s a bunch of talk about single-value registers as opposed logs for abstractions. Duality: log of changes and a table. Log - list of credits and debits; table account balances. Log more fundamental because you can re-derive stuff. Changelog to to get near-real-time replicas. Similar to version control: pull down patches and apply to snapshot. It then talks about why it is useful for things like data integration, real-time data processing, and distributed system design. Skimming this part. With logs we have a logical clock, so subscribers can measure to this (e.g. block height). Allows for reasoning about each subscribers state. Data production is asynchronous from data consumption. Subscribers can subscribe at different rates. Hints at atomic broadcast aka total order broadcast, as a log for messaging system, where multiple processes receveives event in same order. Isolate consumer from soure of data for many different services. Lead to Kafka (and later, AWS Kinesis). Scalability hard. Tricks: partion the log; better throughput with batched r/w; avoiding too many data copies. Each partition totally ordered log, but no global ordering between partitions. Without coordination between shards. Log easy to optimize for read and write patterns. Kafka binary format: same in-memory, on disk and over network. Can do zero-copy data transfers. Together means can r/w data at rate supported by data/network. Also some Real time streaming process, skipping. Data Flow graphs: feeds that result from many feeds. E.g. DAG of logs and jobs impacting other logs. Summary in paper - architecture: handle data consistency (eventual and immediate) for concurrent updates to nodes. Data replication. Handling rebalancing. Example for system with two logical parts: log and serving layer. Client writes to log (or proxied), then log writes to serving node, which is what client reads from. Has some links to related stuff like replication algortihmics, Paxos/Raft, Replication book. Event sourcing as being same as state machine replication. Evaluation: Tool for distributed system design. Useful overview and has some good pointers. A lot of it seems to be implicitly consensus-based though (e.g. distributed cluster vs p2p and local). How kafka achieves fault tolerance: partioned data; brokers and followers; at any time have a leader then N leaders. Election process. Question: When is it desirable to have a single log that we have consensus about? Vs multiple individual logs. A lot of this implicitly has one single distributed log and then replicas. Think more about exactly how a DAG generalizes a log, and what the trade-offs are (e.g. wrt ordering properties and and lack of coordination/consensus), as well to what extent they are the same thing. https://hackernoon.com/thorough-introduction-to-apache-kafka-6fbf2989bbc1 just to see how a distributed kafka cluster works (N participants, one broker at a time that can persist and die, election-based). Implementing Fault-Tolerant Services Using the State Machine Approach: A Tutorial http://www.cs.cornell.edu/fbs/publications/smsurvey.pdf - linked from “The Log” article. Primary Backup approach http://www.cs.cornell.edu/fbs/publications/DSbook.c8.pdf - linked from “The Log” article. Vive La Diff ́erence:Paxos vs. Viewstamped Replication vs. Zab https://arxiv.org/pdf/1309.5671.pdf - If you are “shopping for replication algorthm” read this, according to “The Log” article. Not clear to me how relevant this is wrt consensus, but perhaps worth a skim. https://en.wikipedia.org/wiki/Atomic_broadcast I don’t understand how this works, but total order broadcasting seems useful to understand somewhat. http://www.pmg.csail.mit.edu/papers/vr-to-bft.pdf From Viewstamped Replication to ByzantineFault Tolerance, by Liksov. From Replication book. Seems like there are two branches of replication algorithms, where BFT is a continuation that deals with arbitrary failure. Both came from MIT apparently, and both deal with ‘state machine replication’. Still unclear to me to what extent we need something like BFT/consensus for replication, but worth digging into basics more and understanding trade-offs. Also see: basis of blockchains. Summary: Need immutability to coordinate at a distance, we can afford it with storage requirements. Change in tech and how we do computing. How updates are layered on top of LSF (Log Structured File Systems), COW (Copy on Write), LSM (Log Structured Merge trees). Also implications for e.g. replication [what interested in]. Then talking about hardware and finally trade-offs. Append-only computing. Accountants don’t use erasers or they go to jail. Single-master computing - order changes, either through centralized master or some consensus like protocol. Immutable files - Replication of files w/o update anomalies. linear version history - strongly consistent. alternatively directed acyclic graph - many parents/children, eventually consistent. Versions as immutable objects, a book is published. GFS and HDFS provide immutable files, chunks replicated across data nodes and identified by GUID. [Similar to Swarm?]. Trade-offs: Denormalization, flexible but fat. Write amplication vs read perspiration. Clean replication: data immutable and unique id means fewer challenges. No stale version, so less picky about where replications are, also fewer bugs. Evaluation: General overview of immutability across the stack. Either nothing really new or not super relevant. Useful to think about linear history as strongly consistent vs DAG for eventual consistent though. Question: Is it possible to have a linear version of history in p2p? Probably yes (well, consensus and using a chain of blocks…), but is it desirable? Why / why not. Look more into consistent hashing, it is useful for data partioninging things (need to remap fewer keys). DHT is one example of this. Too wordy, better to read through then jot down summary/notes. Feeling a bit under the weather today, but I spent some time with the excellent Jepsen’s Consistency Model overview https://jepsen.io/consistency, as well as trying to understand the subtleties of various consistency models and session guarantees. Starts with a good overview of the fundamental concepts that consistency models and distributed systems builds on. Operations, processes, invocation/completion times, imaginary real-time, concurrency, history, consistency models. 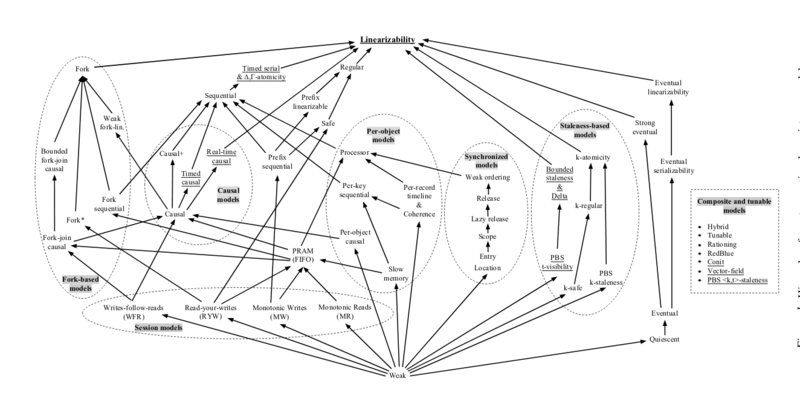 Diagram of various consistency models and how they relate. Several mini articles the various concepts. Zooming in on the most relevant for an exposition. Linearizability: Operations occur in (imaginary) real-time clock order. Can’t be totally or sticky available; Useful if real-time ordering is a requirement. Sequential consistency: Operations appear in some total order that reflects order of events. Individual nodes may lag behind reality. Doesn’t provide availability. Casual consistency: Captures notions that casually-related events should appear in the same order. Casually-independent events don’t. E.g. A: lunch? B: yes C: no, here no one will see yes or not before lunch?, but yes and no might be in different order. For convergent casual consistency, eventually yes and no would be ordered (e.g. based on hash order). There are also other forms of casual consistency, such as Real-Time Casual consistency. The strongest consistency model in available system. If you want total availablity you need to give up read-your-writes property. Casual models come from happen-before semantics by Lamport (potential causality). Session properties for casual consistency: writes follow reads; monotonic reads and writes. Mentions formal treatment that decomposes casual consistency into: CasualVisibility, CasualArbitrarion and RVal (see below). Session properties - Write follows reads: (Wikipedia): Wihin process p, r(x) then w(x), write on x then takes place on same or more recent x. You can’t change the past. Session properties - Monotonic writes: If a process does w1 then w2, then all processes observe w1 before w2. Session properties - Monotonic reads: If a process p reads r1 then r2, r2 can’t reflect a state written before r1. You can’t read backwards. Session properties - Read Your Writes: This one is interesting, because it is not totally available, only sticky available. If you write to a process, you should be able to read that value after. This is also why Casual Consistency isn’t totally available. Sticky availability: If there’s a network partition, all nodes can progress, as long as client is connected to the same ‘server’. There’s also PRAM (pipeline random access memory) which is weaker. 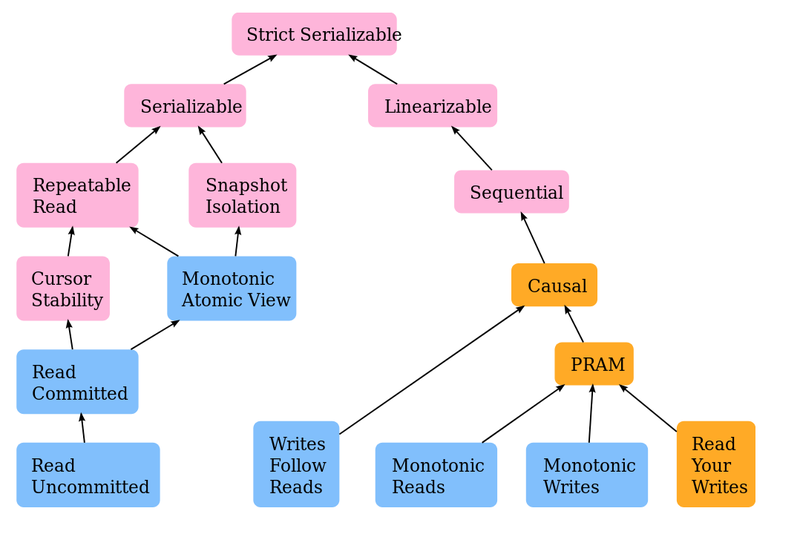 As well as a bunch of Serializability models, that deals with read committed/uncommitted and monotonic atomic view, snapshot isolation, cursory stability, and repeatable reads. Really useful to understand design space of consistency models, what guarantees they provide and why you might want one or the other. Didn’t look into Serializability/Transaction side of tree too much (read committed/uncommited, montonic atomic view). Question: Are there use cases when a total ordering is a requirement, and we can sacrifice availability (or network partitioning)? Question - why is casual consistency not totally available but only sticky available? I think I understand if your model is client-server, and you write and then try to read. But not 100% intuitive, especially how it differs vs other session models. Question: What consistency model does Bitcoin/Ethereum provide for? See below for skimmed resources. Documenting session properties seems useful, and impacts how to consume protocol. Comment on Monotic Writes: In Bramble model, you don’t deliver writes until you have message dependencies. This ensures this session property is provided for. Question: But how does that work if you do have w2 message but for some reason can’t find w1 due to that data not being available? That seems like the same as not having gotten w1 or w2 in first place, so perhaps it reduces to what we mean by availablity and eventual consistency in the first place. I’m a bit worried people won’t fundamentally grok casual consistency, so how do we render this in a reasonable way? What would two parents in UI look like? Does convergent casual consistency makes sense for us? How would it be rendered? Is there something similar to Bitcoin’s Omega factor w.r.t probability of message persisting? Swarm and data availability problem. It turns out casual consistency is family of algorithms. What do other versions of casual consistency provide and why might you want to use them / not? Also see below on some skimmed. [Principles of Distributed Computing (lecture collection), Roger Wattenhofer] (https://disco.ethz.ch/courses/podc_allstars/) link2. Explores pearls of distributed computing. Including byantine/authenticated agreement, quroum systems, eventual consistency and bitcoin, distrbitued storage, game theory, and routing. Is also a course. Eventual consistency - Amazon CTO on eventually consistent variations, including read-your-writes and stickiness. Consistency in Non-Transactional Distributed Storage Systems Formal treatment. This is what Jepsen refers to. Interesting casual family and fork based (new family of consistency models?). many different types of casual consistency, also fork based. Worth having a look over. Has this graph. Consistency, Availability, and Convergence - on Real Time Casual Consistency. Time, Clocks, and the Ordering of Events in a Distributed System, Lamport. Classic. Read before but was a while ago. Emin Gün Sirer, 2016 provides a nice way of thinking about it. Brief summary: Bitcoin (and Ethereum) provides strong consistency through serializability. You need to look at Bitcoin as a read protocol and write protocol, considerings its outputs, not the internal state. It guarantees serializability, with a probability that is exponentially decreasing with latency. Can’t say it is inconsistent just because you can have re-orgs, that’s like saying it is works like MongoDB as a DB. Instead: for the read protocol you can discard Omega blocks, and you can analyze what this is to get the desired probability of anomaly. Using a low Omega (0 confirmations) just means you are not leveraging the consistency that Bitcoin provides. This parameterization property is indeed very nice, since it depends on use case (0-conf for coffee vs 6-conf for bigger transactions, etc). [It should be noted that there appears to be disagreement about how to classify this in academia; most important is being able to rigorously argue for what properties it has, incl probability of failure etc]. The way to make sense of it seems to be that it’s about client-view consistency, not data per se. E.g. client+server as node slightly different (since they fail together). Via a classic partitioning argument, we can see that RYW is not achievable under the stringent CAP availability model. We can partition a client C away from all but one server S and require C to perform a write. If our implementation is available, S should eventually acknowledge the write as successful. If C reads from S, it’ll achieve RYW. But, what if we partition C away from S and allow it to only communicate with server T? If we require C to perform a read, T will have to respond, and C will not read its prior write. This demonstrates that it’s not possible to guarantee RYW for arbitrary read/write operations in an available manner. Session Guarantees for Weakly Consistent Replicated Data. More on session guarantees, how apps can get view of db that is consistent, when it is reading from inconsistent servers. Developed together with Bayou Project at Xerox. Relates to mobile intermittent connection and replication strategies. Worth skimming for mobile angle. Eventually Consistent by Werner Vogels, CTO of Amazon (2008. Popularization of eventual consistency model. Based on client-server. Include mentions of RYW, etc. Nadim Kobeissi, who wrote Cryptocat and recently formally verified Signal and TLS, teaches the following course: https://computersecurity.paris/. It includes things like: threat modeling, excerpts on secure messaging, crypto, network security, handshake protocols etc. Seems like an up-to-date and exciting curriculum with relevance to Secure Messaging in general. Lots of pointers too. Practical course. – How does this interact with awesome-secure-messenger repo? Fever, but the research continues, albeit abbreviated. Let’s look briefly at casual consistency and fork join consistency models. Consistency used to be a more vague notion, e.g. what does “strong consistency” really mean? This survey paper looks at more than 50 different notions of consistency in distributed systems, especially with a focus on storage systems. It then decomposes them into specific formal properties that hold, and creates a graph that shows hows different consistency models are related. It relates both to database literature and distributed systems literature. Uses graph theory and first-order logic to describe and classify consistency semantics. Mostly interested in getting a rough idea of fork-join based models and casual consistency family. See picture posted yesterday. Classify consistency semantics into ten families. Abstract execution: multi graph A=(H,vis, ab). Vis and ab captures message delivery order and e.g. conflict resolution. Looking at relations between operations in a histoy and justification, e.g. vis (visibility) that accounts for propagation of writes, ar (arbitration) total order that deals with conflict resolution. Update: visibility is an acyclic relation that acconuts for write propagation. If a is visibile to b (a vis-> b), then effects of a are visible to a.
happens-before semantics (Lamport 1978) was originally for messaging passing systems but then seems to have turned out to be equivalent to consistency model for shared-memory. Trust limitations for storage and computations led to dealing with byzantine faults. What consistency guarantees can you get in an untrusted environment? Fork-linearizable models guarantee that if the visible histories of two processes differ for a single operation, they may never observe each other’s writes. Other forms of fork models, fork-sequential, fork-join casual consistency, - this seems eerily similar to things like things like CBC Casper. That’s largely part of (separate?) consensus literature, which I don’t want to go into right now. Probably a lot more in consensus and Ethereum etc lit. Byzantine general problem: [https://www-inst.eecs.berkeley.edu/~cs162/sp16/static/readings/Original_Byzantine.pdf](Lamport, Leslie, Robert Shostak, and Marshall Pease. “The Byzantine generals problem.” ACM Transactions on Programming Languages and Systems (TOPLAS) 4.3 (1982): 382-401.) - classic, worth re-reading. Could look into this but seems like too much of a rabbit hole, probably better use of time to go to p2p direction. Wyatt Lloyd, Michael J. Freedman, Michael Kaminsky, and David G. Andersen. 2011. Don’tsettle for eventual: scalable causal consistency for wide-area storage with COPS. InACMSymposium on Operating Systems Principles (SOSP). 401–416. Mahajan, Prince, Lorenzo Alvisi, and Mike Dahlin. “Consistency, availability, and convergence.” University of Texas at Austin Tech Report 11 (2011): 158. Bermbach, David, and Stefan Tai. “Eventual consistency: How soon is eventual? An evaluation of Amazon S3’s consistency behavior.” Proceedings of the 6th Workshop on Middleware for Service Oriented Computing. ACM, 2011. Bernstein, Philip A., and Sudipto Das. “Rethinking eventual consistency.” Proceedings of the 2013 ACM SIGMOD International Conference on Management of Data. ACM, 2013. Bailis, Peter, and Ali Ghodsi. “Eventual consistency today: Limitations, extensions, and beyond.” Queue 11.3 (2013): 20. Bailis, Peter, et al. “Quantifying eventual consistency with PBS.” The VLDB Journal 23.2 (2014): 279-302. Unclear if worthwhile, but especially p2p would be interesting. Something on hashes in p2p and how it relates to byzantine cases? [https://hal.inria.fr/hal-01350652/document](Balegas, Valter, et al. “Geo-replication: Fast if possible, consistent if necessary.” IEEE Data Engineering Bulletin 39.1 (2016): 12.) - hybrid RedBlue convergence that attempts that both strong and casual consistency. Might take tomorrow off depending on how I feel. Most consistency models literature has been in the context of traditional distributed database systems. Now it’s time to explore more of the literature for p2p, with the goal of finding out how nodes join, link up, etc. In the context of data replication. Unstructured: ad hoc, data locality unrelated to topology. Each peer knows its neighbors but not what resources they have. They then talk about things like query expressiveness (key lookup/sql-like query). Strucured networks: Emerged to solve scalability problem. Done by controlling overlay topology and data placement (data or pointers to data). DHT (Distributed Hash Table) main example. Each peer has some neighbors with a routing table. Usually: lookup to find peer with desired data, then communicate with peer directly. Can find key in O(log N). Downside: autonomy limited, since node is responsible for some piece of data. Also: usually for exact key searches, but possible to generalize somewhat. Examples: Chord, CAn, Tapestry, Pastry, Freenet (semi-structured), etc. Super-peer: Unlike unstructured and structured, super-peer servers aren’t pure. Each peer provides equal functionalities. Super-peer are hybrid client-server, and if just using one it is same as client-serve. These super-peers provides services such as: indexing, querying, access control, meta data etc. Advantages: efficiency and quality of service. Takes advantage of different resource consumption. Also access control [NB Bad boy!]. Restricts autonomy (can’t login to any node) and worse fault tolernace. Possibly dynamic replacement [mailserver round rubbin hurr-hurr]. They then compare the three approaches. Essentially super-peer has moderate autonomy and low fault-tolerance, but high everything else. Unstructured has low efficency, QoS and security, but high in other aspects. Structured low autonomy, query expressiveness and security, high in everything else. Napster: Relies on central service to mediate, super-peer. Replication occurs passively. Super peers as single points of failure. Only stores static data. Gnutella: To obtain shared file node/requestor must perform three tasks: join network, search for desired file and download it. Join with bootstrap nodes, then search with flooding. Passive replication. Active replication strategies proposed (see further reading Q. Lv). Only deals with static files. Chord routing system on top of DHT. Uses consistent hashing. CAN, Tapestry Freenet etc but didn’t look into here. What about hybrid approaches between these p2p overlays to get best of both worlds? Also which aspects put more of a premium on? QUESTION: Are super-peers desirable for some contexts? What are the main invariants we want to avoid? Something like: each round is a fresh, i.e. arbitrary which we use and can select K. No privileged read. Compare with e.g. Matrix federation and our mailservers. We do want to take advantage of different resource consumptions, but it’s about it not being a special relationship. Also see miners etc. Has to be a lot more research on this. Also leads to me to all these validator designs people have in Ethereum, a lot of them seems way overkill and like a bad alternative to basic operations. It needs to be integrated or very simple, probably. Unstructured optimization: Is this roughly what was initially intended for Whisper? Why is Gnutella so well studied? They seem more interested in collaborative semantically rich data like SQL. => How many logs can you realistically keep on mobile? Question: How can we do efficient search and replication in p2p networks? Lv, Qin, et al. “Search and replication in unstructured peer-to-peer networks.” Proceedings of the 16th international conference on Supercomputing. ACM, 2002.. Attempts to improve on e.g. flooding based query algorithms in unstructured networks, such as Gnutella. For example: multiple random walks, which can reduce network traffic by two orders of magnitude. Many citations, worth reading. Yang, Beverly, and Hector Garcia-Molina. “Improving search in peer-to-peer networks.” Proceedings 22nd International Conference on Distributed Computing Systems. IEEE, 2002.. More efficent search as well. Kalogeraki, Vana, Dimitrios Gunopulos, and Demetrios Zeinalipour-Yazti. “A local search mechanism for peer-to-peer networks.” Proceedings of the eleventh international conference on Information and knowledge management. ACM, 2002. - improve BFS with key for search, and use past behavior to steer. Chawathe, Yatin, et al. “Making gnutella-like p2p systems scalable.” Proceedings of the 2003 conference on Applications, technologies, architectures, and protocols for computer communications. ACM, 2003. Crespo, Arturo, and Hector Garcia-Molina. “Routing indices for peer-to-peer systems.” Proceedings 22nd international conference on distributed computing systems. IEEE, 2002.. Checking Lv, Qin et al. above “cited by” and ordering by citations gives https://scholar.google.com.tw/scholar?cites=17818466769784722704&as_sdt=2005&sciodt=0,5&hl=en which leads to more reference works, such as Modern Information Retrieval (too broad) and Principles of distributed database systems (probably too broad, but there is a chapter on data replication with some further resources) and A survey of peer-to-peer content distribution technologies (comparative approach across dimensions such as scalability, access control, anonymity, etc - seems useful). Clarke, Ian, et al. “Protecting free expression online with freenet.” IEEE Internet Computing 6.1 (2002): 40-49. Collecting for evaluation. Challenge: right table (problem-fit, relevance) and minimal set of consistent dimensions and comparables. Outside of replication attributes above, consistency model, we also have P2P overlay topology type, and probably ~join|find|pull method. Plan of action: go through specific applications and describe them along relevant dimensions. Timeboxed. At the end, do brief comparison. E.g. something like: Briar, Matrix, Scuttlebutt, Tox, Swarm. Briar synchronizes data in a group context among a subset of devices called peers. It’s not an unstructured network nor a super-peer network. Since you have direct connections with each other you might classify it as a direct p2p network, or possibly a structured p2p network, since A talking to B means A knows B has its own log of data. It is not anything like a DHT though, so perhaps this notion makes less sense for f2f networks. BSP requires a transport security protocol to communicate between devices. Peer discovery: to sync up initially requires meeting up in person. To know how to reach a device Briar keeps track of transport properties. For short-distance it uses BT/LAN discovery beacons, and for long distance it uses Tor hidden services. Look into Tor hidden services interface more, both in general and in Briar. E.g. see onion addresses. Assumptions: A Briar node runs on a mobile device, but it runs in background. This means currently mainly Android is supported, and there are some battery considerations. Though it is less than in an unstructured network. Briar and problems with battery consumption. Additionally, there’s some resources on Tor specific battery work that I can’t find right now. In Briar asynchronous, optimistic replication is practiced. This means you append to your own log, and then try to sync up with other nodes in some group context. Since each message is immutable and hashed, conflicts are likely to be rare. Conflict-resolution: Unlikely to be a problem due to hashes, but in the case it is it is presumed validation will take care of this in a straightforward manner. Briar’s have weak network assumptions, and it can sync over pretty much any medium. Including USB sticks, BT, and Tor. It only requires the ability to securely transport something from device A to B.
Replication data: For individual objects, it is single-master and ‘static data’ since only a device writing a message can write it, and it doesn’t change after that. No other node can change a message. This is the minimum object being replicated and is essentially a simple file. However, if we look at the whole thing being replicated in a group context, it is really a DAG. This DAG can be updated by all the members, and since it is a DAG it is a form of CRDT. This means it might be more apt to classify it as a dynamic data; multi-master setup. Exactly how resolution works in case of group membership conflicts needs to be studied more carefully. The semantics are fairly coarse, but well specified through a finite state machine. E.g. see [private group sharing client[(https://code.briarproject.org/briar/briar/wikis/Private-Group-Sharing-Client). Since all devices participating in a group sync context are interested in messages of that group, it is a form of passive replication. No other helper nodes are active by default in Briar, e.g. there’s no active replication involved. If there were, these nodes would have to choose between seeing the encrypted messages or see the shape of the DAG, since the DAG is encoded inside a message through message dependencies. This is different from, say, a linear log where the contents could be encrypted but the sequence number would be transparent. There are some plans to have a “relayer” node that actively replicates for you, to get better latency guarantees for offline inboxing. Full vs partial replication: within a group, a set of peer for a single node is a subset of the devices within that group. Messages are thus partially replicated by default, but it is likely it’ll settle on full replication as an individual node is interested in all the messages of a group context. But the contract is a partial copy of the graph, so it is a form of partial replication. Pull/push call: there are different synchronization modes, i.e. interactive and batch mode. These are coordination-less and up to the client. I.e. either you can request specific messages or offer messages to someone else. This can either be in on go (send all messages) or more efficient by offering message ids, then waiting for a specific request. There doesn’t appear to be any specific “request all most recent messages” API call. To ensure casual consistency, a message is only delivered once all its message dependencies have been delivered. This ensures Monotonic Writes (MW). Additionally: it is possible to delete/unshare messages (while retaining some information to fill in the partial graph). TBD: How exactly it ensures WFR, MR, RYW, MW (above) session properties. Matrix can be looked at in a few different ways. They provide a suite of protocols, and by default an end user uses their client server API and then each server uses the server to server API for data syncronization. This is a form of federated or super peer architecture, since a Homeserver has special capabilities. This means individual endpoints don’t need high availability. It is also possible to do pure P2P by hosting your own homeserver. We won’t look into this here, as it isn’t currently widely practiced and has its own challenges. Federation: Homeservers can send multiple types of messages, not all which needs to be sync. This is a form of framing. They distinguish between Persisted Data units (PDU), ephemeral (EDU) and queries. PDUs record history of message and state of room. EDUs don’t need to be replied to, necessarily. Queries are simple req/resp to get snapshot of state. Like Briar, Matrix uses DAGs in PDUs. Their equivalent of a group context is a room. Additionally, Matrix separates prev_event from auth_events. Auth events are special events that contain previous room state etc. In Briar, this separation is a bit more general and the semantics are encoded in a state machine for each specific data sync client. PDU validation: checks if events are valid, signatures, hash and various auth rules match. Soft failure / ban evasion prevention: in order to prevent user from evading bans by attaching to an older part of DAG. These events may be valid, but a federation homeserver checks if such an event passes the current state auth checks. If it does, homeserver doesn’t propagate it. A similar construct does not appear in Briar, since there’s no such federation contruct and there’s no global notion of the current state. EDUs are used for things such as presence notifications. There’s a room state that contains e.g. room name, and they have techniques for room state resolution, e.g. a form of conflict resolution. This may look different depending on which room version is used (client id for data sync client in Briar). Once a homeserver joins a room it gets new events by other homeservers in that room. Users might request previous history before homeserver was part of this room. Homeservers can get previous history from each other with the /backfill API or /get_missing_events. The above implies homeservers practice partial replication, i.e. a node doesn’t need to have all state to be functioning. Since Matrix is a form of federated/super-peer architecture, we can also look at it as a client server architecture. A client authenticates with a server in some fashion. Client discovery of homeservers happens out-of-band, for example by a known URL. TBD: How does failure work if a user’s homeserver fails? Can you seamlessly be connected to several homeservers? TBD: Homeserver discovery? It appears that you need to know a hostname for homeservers to connect. It is not clear to me if this can happen in-band, e.g. through some form of propagation. Conversation history is ‘linearized’ eventually (casual) consistent event graph into an event stream for the end user. There are two types of room events: state events and message events. State events describe metadata and overwrite each other. Message events are transient one-off events. Applications can also add their own type of events. To me it seems like this is mostly putting data sync client of Briar into the data sync layer itself. E.g. message/state events are different event types with different semantics. The main difference is the soft ban / intermediation that servers can do to check current auth state. It isn’t clear what this would look like if each server is a homesever, since this enforcement is up to each node. This makes moderation and group membership an interesting topic, and the state can possibly look different for different people. But assuming there’s a well-encoded rule set and clients are well-behaving, this should be fine. To sync, a client simple calls GET /sync. This returns most recent message events and state for each room, it is thus a pull API. This also gives you a pointer to know how to only get most recent states, as well as how to go further back in the event stream. I.e. a prev_batch and next_batch field. To get new events, Matrix uses HTTP long polling. There’s thus a persistant connection with a homeserver, that is assumed to have high uptime. TBD: How is the partial graph compacted into an event stream? For clients to send events, it sends a PUT request to its homeserver. This means event is acknowledged once homeserver, and homeserver assumes responsibility to deliver it. This is true both for state events and message events. TBD: If a homeserver goes down, is it possible to do message resends to a different homeserver? TBD: Why exactly do they make sure a big difference between? Is it simply because of the soft failure / ban evasion case? They also support redaction of events, which strips off a lot of common keys. For room creation in client-server API they use POST requests. TBD: In case of redactions/deletes, how does the hashing change not change? Doesn’t it break the immutability invariant? Same question for Briar. Homeservers can query each other’s public rooms through a public room directory, which is a form of discovery mechanism. Client server API end to end encryption is optional. Key exchange happens out of band, and its public key is uploaded to a homeserver. Multi device: A user has a user id which can be queried through homeserver, and this contains list of all device identity keys. For E2EE it is only the content of the message that is encrypted from what I can tell, not event types or who it is sent to. This means the DAG is transparent to the homeserver, even though the home server isn’t an end-user endpoint. TBD / out of scope: They use the Olm crypto ratched for E2EE. It isn’t clear to me how it differs from Double Ratchet. TBD / out of scope: For group chat they use Megolm variant, which is more scalable for group chat. It isn’t clear to me exactly how it is more scalable in terms of e.g. algorithmic complexity. It is multi-master since many people can write to a room. Depending on if it is a message event or room state change different conflict resolution might be required. From a client’s point of view to a homeserver it is synchronous (PUT request acts as a confirmation). Between home servers it is optimistic asynchronous. Like Briar, it provides casual consistency through a DAG. TBD: Conflict resolution algorthim for room state exact semantics. TBD: Treating each user as running their own homeserver, how it change things. Probably requires looking into more detailed Github issues / planning docs / code, as right now the details are a bit hazy. Note: Clients can send messages to a room without knowing who is participating in it, this is a form of pubsub. Partial replication, since a homeserver doesn’t need all events to start being used. Transactions: homeservers sync PDUs/EDUcs in transaction of some limited size (~50/100). These are synced in a HTTP PUT, which gives ACK semantics (200 OK). Additionally, errors can be returned with the 200 such as not allowed to send messages to room, wrong version, etc. Room Version 3 is the latest spec for rooms. In Briar this would be a specific data sync client. It specifies things like room state resolution (actually in room v2 spec). It uses things like revers topological power ordering. Discovery: Locally it broadcasts UDP beacons for discovery. Have a concept of pubs, ssb peer available publicly and you can be invited to it. This acts as a form of super-peer (?). Each user has a feed which is a list of all messages posted by an identity. This is an append-only log. Each message has a pointer to previous one. This points to them using a form of casual consistency. Each message has a link to previous message with a hash, author which is a public key of where it should appear, and sequence number for position in feed. Also timestamp, hash, content. Field are in a specific order. Message ID is a hash of messages with their signature. A SSB client maintains a set of feeds they are interested in. When peers connect, they ask each other if the feeds they care about have any new messages. There’s of blobs for attachments etc. They can be linked from meesages. Peers signal with ‘want’ and ‘have’ (request and offer in Briar). A feed can follow another feed, this means they are interested in messages from that feed. To follow, you post a special message on your own feed. This message is signed with author, and content includes identity of contact want to follow. Each feed announces which feed they are following publicly. This means clients can arrange feeds into a graph of who follows who. By doing this, we have several layers of a social graph: a user’s own feed, the feeds it explicitly follows (visible in UI), 2 hops away client fetches and stores messages (but doesn’t display), and 3 hops clients see these feeds mentions but doesn’t store. Layer 0: write, layer 1: read, layer 2: store/fetch; layer 3: aware. Clients can choose how they want to display these messages. Pub is a publicly accessible SSB node, it serves social and technical purpose: socially as a gathering point for new users. Technically it has a stable IP and allows incoming TCP connections. Joining a pub means you follow it and it follows you back. A lot of emphasis is on content discovery, which happens automatically when you join a pub since you are two hops away from other users of that pub. After following a pub a user discovered new feeds and don’t need to follow pub for feed visibility. Though pub helps with replication and accepting incoming TCP. Any user can follow a pub. But to get pub to follow you back, you need invite code. Invite codes can work in different way (e.g. single use, etc). Similar to Briar, SSB is offline by default, and deals with short-distance discovery well through lan beacons. Similar to Bittorrent local peer discovery BEP 14 or SSDP based on UDP. It is a form of private p2p, but group based, as you can see more than one hop. TBD: What happens if a pub doesn’t follow you back? TBD: Can this be a setting? I.e. access control up to each node how visible they want to be. Private messages are encrypted and posted to own feed like normal messages but e2ee. Note: I like their protocol guide that link to specific parts of various implementations. TBD: Privacy preservation seems unclear. Threat model? Options? TBD: How does replicaiton and gossiping work in more detail? Peer connections: once SSB peer discovered IP/port/pubkey of a peer that can connect via TCP it asks for updates and exchanges messages. Handshake and connection based to create encrypted channel. JSON RPC protocol. E.g. createHistoryStream which asks a peer for list of messages for specific feed. Scuttlebot behaves just like a Kappa Architecture DB. In the background, it syncs with known peers. Peers do not have to be trusted, and can share logs and files on behalf of other peers, as each log is an unforgeable append-only message feed. This means Scuttlebots comprise a global gossip-protocol mesh without any host dependencies. A key difference with other p2p architectures is that it doesn’t use singletons such as a DHT. Instead it operates on a human user network which is a form of group-based private p2p. Also see [https://ssbc.github.io/docs/articles/design-challenge-sybil-attack.html](SSB on sybil attack). A pub is just a normal helper client, and anyone can run it. Thus it doesn’t act so much as a super peer, but it helps with active replication for other peers, if you have a static IP. All data is eventually consistent, or casually consistant within one log (total order), globally there’s a partial order, similar to Briar and Matrix. TBD. “There’s a proposal to used signed pings to measure the “freshness” of a feed, but this could only be used in small groups of interested peers.” Not clear where this proposal lives. Privacy-preservation: https://ssbc.github.io/docs/ssb/end-to-end-encryption.html “Private-box” proposal (?). For hidden recipents. It appears to be partially replicated since you can choose how much of the partial graph you want to sync. Unlike Briar and Matrix, there’s no strict notion of a room with specific semantics. Instead everything is your log and other logs you sync, with fluid discovery/gossiping of interests. It is optimistic async, since you sync your own log locally. It is single-master since you only write to your own growing log, and sync other people’s logs separately. It is either a form of direct or structured network since data locality is in a specific peer, or possibly two hops away. TBD: Exactly how policy for sharing is decided. I.e. why do my messsages end up at pub, and how does this get to another pub and then to B recipient? Gossip based but more details would be useful on this type of active replication. The log/feed structure is not encrypted, instead only content is. The main idea here is that it’s a private network and you trust your friends (and your friend’s friends?). Added minor to people, also a bunch of papers in Zotero (see https://www.zotero.org/groups/2306124/secure_messaging/items for latest). Continue with other real-world applications, such as Tox, Swarm, IPFS, (Whisper, Status), (Bittorrent, Git, Tribler). Create table of comparison of these. Collecting descriptions per stack first instead, since (a) there’s no usually very little agreement on what terms to use (b) these tools are generally too new to have been studied in any academic surveys. Local peer discovery how generalize and work for us, what’s needed (RFP). This relate to transport properties component, and would be amazing for conferences. This looks super interesting I forwarded this to Twitter.com/etzrodtmartin , who is pursuing collaborative research efforts at Akasha. Combines work from 27 and 28th too. Plan of action: resume work and look into Tox, Swarm, Tribler etc. Sketch comparison. Should timebox this and focus on data sync more specificially. Tox is a p2p instant messenger and protocol with a focus on security and privacy. They have many clients and they support audio and video capabilities. There is a Tok Tok project as well that seems to be essentially the same (?). Current focus is on things like a formal spec and executable model. Transport Protocol below Tox protocol. Supports UDP and TCP. Binary representation a single bit, 0/1. Protocol packet different message types, ping req/resp, nodes, crypto handshake, dht req, onion req, annonuce, bootstrap info, etc. DHT based so it is an structured, public p2p network, self organizing swarm of all Tox nodes in network. ctrl-f: no mention of replication, retransmission, log, consistency [hmm]. Some of “sync” and “offline”. Sync: state and group syncing, if receiving higher version number then search DHT ~. Friend connection takes care of establishing the connection to the friend and gives the upper messenger layer a simple interface to receive and send messages, add and remove friends and know if a friend is connected (online) or not connected (offline). Does this mean only online messaging works? “Mesenger” (with all various message types) is on top of friend_connection, which sits above DHT/onion/net_crypto. Create connection over relayer, use onion to search. Can establish direct TCP or UDP connection but it isn’t clear how req/res works, or message history, etc. There’s a separate Tox Multi device proposal doc In it it seems like data sync is tentative. Oh well. Let’s move on for now. Interesting to note how Tox and Briar both punt on anonymity to Tor. This seems like it’d be useful to allow other projects to integrate this mixnet, e.g. allowing Tox and Briar to hook into it. If the DHT keypair is rotating, how does identity work? Distributed storage platform and content distribution network. Base layer for web3 stack. swarm up foo.md => hash of swarm manifest; manifest is a json file; manifest ensures you download file with right mime type, multiple entries, etc. Dealing with mutability of resources through ENS (blockchain) and Feeds in Swarm. feed = user + topic; can give illusion of subtopics by e.g. taking hash of photo and adding “-comment” string. What is the consistency model of Feeds? It updates, but I assume there can be stale reads. How does it work in case of concurrent updates? Access control for content: password, by pk for one participant or with act (multi grantee). ACT strategy - where can I find more info on this? A Swarm Hash aka bzzhash is a Merkle tree, ~drop in replacement for e.g. SHA3. Can verify integrity of partial content without having to transmit all of it, thus allow random access. Since ENS is a smart contract its consistency models follows that of the underlying chain; Feeds is off-chain, so what consistency model does it have? Auto scaling: nodes cache content that is passed on at retrieval, this leads to maximum resource utilisation and a garbage collection process removes least-accessed. Feeds update consistency live where who can update? Who can update a feed? Best interface for using DPA as extension of data sync? So to call most E2E chat systems TOFU is far too generous. It’s more like TADA — Trust After Device Additions. WARNING: This is an early draft, and likely contains errors. This document compares various forms of data sync protocols and applications, along various dimensions, with the goal of making it easier for you to choose which one is for you. Node: Some process that is able to store data, do processing and communicate with other nodes. Peer: The other nodes that a peer is connected to. Peer-to-peer (P2P): Protocols where resources are divided among multiple peers, without the need of central coordination. Device: A node capable of storing some data locally. User: A (human) end-user that may have multiple devices. Data replication: Storing the same piece of data in multiple locations, in order to improve availability and performance. Mobile-friendly: Multiple factors that together make a solution suitable for mobile. These are things such as dealing with mostly-offline scenarios, network churn, limited resources (such as bandwidth, battery, storage or compute). Replication object: Also known as the minimal unit of replication, the thing that we are replicating. Friend-to-friend network (F2F): A private P2P network where there are only connections between mutually trusted peers. Content addressable storage (CAS): Storing information such that it can be retrieved by its content, not its location. Commonly performed by the use of cryptographic hash functions. Is minimal unit of replication necessarily the right abstraction? E.g. messages but you care about conversation, chunks vs files, etc. We look at generally established dimensions in the literature [TODO] [TODO], and evaluate protocols and applications based on these. Specifically the focus is on p2p applications that perform some form of data synchronization, with a bias towards secure messaging applications. All notes are tentative and are based on the provided documentation and specification. Code is generally not looked into, nor has any empirical simulations been performed. These results have yet to be reviewed so take them with a grain of salt. These dimensions are largely taken from the survey paper [TODO]. For single-master, there’s only a single node that writes to a specific piece of data. The other peers purely replicate it and don’t change it. For many of the studied systems, content addressable storage is used. This means the replication object is usually immutable, and it is only written to once. As a side effect, many systems are naturally single-master from this point of view. This is in comparison with the survey paper, where they are more interested in update-in-place programming through replicating SQL DBs and other “rich” data structures. However, if we look at what is semantically interesting for the user, this is usually not an individual message or chunk of a file. Instead it is usually a conversation or a file. Seen from that point of view, we often employ some form of linear or DAG-based version history. In this case, many participants might update the relevant sync scope. Thus, the system is better seen as a multi-master one. To capture this notion I’ve modified single-master dimension to be w.r.t. replication object or user scope point of view. I suspect the latter is more informative for most cases. TODO: Tighten up above paragraph with better definitions. framing - support for nosync messages? This includes both applications and specification. The level of rigor and nomenclature varies between projects. Apples to apples: Does it really make sense to compare Matrix with something like Swarm directly? This also depends on how decomplected protocols are and to what extent they can be studied in isolation. More technologies: Bittorrent, Git, Tribler, IPFS. Whisper, Status. Similarities and differences: Since a lot of protocols make the same choices, it might make sense to break similarities apart and focus on differences. Similar to what is done in Whisper vs PSS [TODO]. How deal with other things that are kind of replicated but differently? E.g. metadata, etc. Auth state, ephemeral, manifests, feeds, etc. *Request for comments: What’s a better way to decompose these properties? Ideally something like 2-5 dimensions that matter most. Right now it reads a bit like a laundry list, or like an ad hoc classification. These dimensions are largely taken from the survey paper by Martins as well, with some small tweaks. To make it easier to survey, we divide up the dimensions into rough sections. 1. Why and what are we syncing? Problem domain. Why are we syncing stuff in the first place? Minimal unit of replication . The minimal entity that we can replicate. The actual unit of replication is the data structure that we are interested in, usually a collection of entities. Related: version history abstraction (linear vs DAG). Read-only or read and write. Is the (actual unit of replication) data static or not? Active vs passive replication. Are participants replicating data that they are not interested in themselves? 3. When and where are we syncing? Single-master vs multi-master. Both entity and collection. Synchronous (eager) vs asynchronous (lazy). If asynchronous, optimistic or not. Replica placement. Full or partial replication. 4. How are they syncing? P2P Topology. Public or private P2P? Unstructured/structured/super-peer or friend-to-friend/group-based? Peer Discovery. How do peers discover and connect with each other? Transport requirements. Any specific requirements on the underlying transport layer? 5. What guarantees does it provide? Consistency-model. What are the guarantees provided? Privacy-preservation. Assuming underlying layers provide privacy, are these guarantees upheld? 6. Engineering and application, how does it work in practice? Actively used. Is an instance of the protocol used in the real-world? Mobile friendliness. Any specific considerations for mobile? Well-defined spec. Is there a well-defined and documented spec to refer to? Protocol upgradability. Are there any mechanisms for upgrading the protocol? Framing considerations. Does it support messages that don’t need replication? As well as filling in properties and comparisons of various properties.